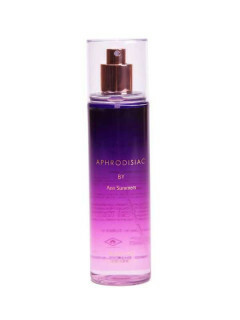 Aphrodisiac Bath SetContaining Body lotion 100ml. Bath and shower gel 100ml Body oil 100ml. Body mist 150ml.The Aphrodisiac fragranced bath set makes a luxurious..
There’s even more ways to love our exclusive signature scent with our new Aphrodisiac Body Mist. A seductive and enticing fragrance, the blend of the jasmine mid tones and sweet vanilla shades will aw.. Noir body lotion and parfum set 150ml - Shimmer Body Lotion 100ml - Noir Eau de ParfumA luxurious gift or treat for yourself, find new pleasures in the alluring blend of African orange flowe.. This fragranced set contains everything needed for the ultimate pamper evening. Enjoy the sweet and feminine blend of jasmine, vanilla and warm musk, perfect for date night. Ravishing Body lotion.. Ravishing body lotion and parfum setSoft, feminine and oh so seductive, revitalise your senses with this Ravishing Perfume Set. Enjoy the luxurious blend of beautiful jasmine, vanilla and warm musk. M.. Including 3 x 10ml of our popular Ravishing, Aphrodisiac and Noir perfumes, these mini roller fragrances are the perfect size to pop in your handbag or suitcase.Set of 3 eau du parfum..